No pulse, no heartbeat. If condition does not change, this man is dead. 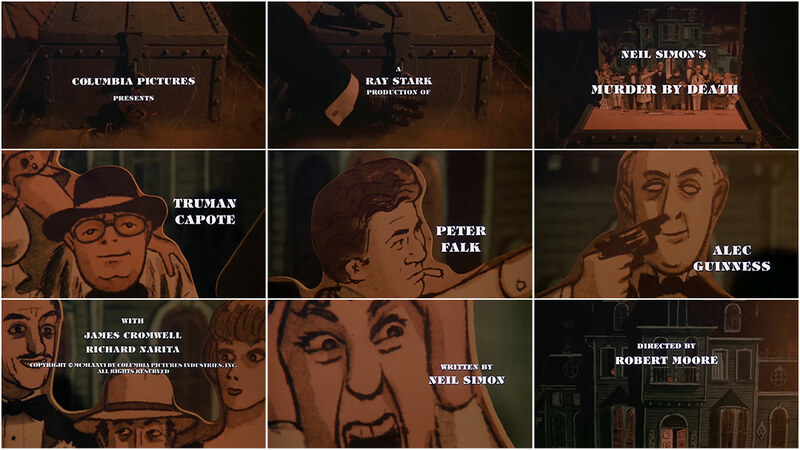 Wayne Fitzgerald’s opening titles for Murder by Death produce more questions than answers, but that is the MO of any mystery worth its salt. 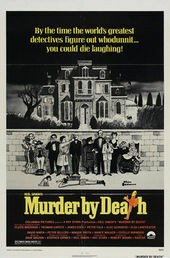 As the titles “Murder” and “Death” hover ominously, it takes the audience a moment to register that the illustrated cutouts aren’t the familiar Addams Family characters from the New Yorker, but rather a new set of characters drawn by Charles Addams acting out a scene of miniature malice. And then *bum BUM* the kettle drum confirms the viewer’s suspicion that this is no ordinary mystery… this is murder. The drum beats again and the plot thickens: A corpse lies on the floor, eleven knives bristling from his back. Eleven knives, eleven suspects! The camera tracks right and left scanning each artfully rendered face, but the expressions of all these would-be murders remain static – save for their suspicious, shifty little eyes. It's impossible to read their dubious gazes, but whether or not we can deduce the culprit makes no matter because, in the end, the titles only promised us a mystery… and nothing more.